"It's not just any old sacrifice! It's a sacrifice that paves the way!" "Let us go to war, my strongest soldier! Glorious mechanical dragon! Gallop across the Earth! I ride...Tyrant Deathrex!" Anime Biography: First appearing in ride 27 as Aichi's opponent at the first national tournament, Gunji is the charismatic captain of Team Jurassic Army. A soldier at heart, Gunji keeps himself firmly grounded in the reality around him, and focuses on playing practically. 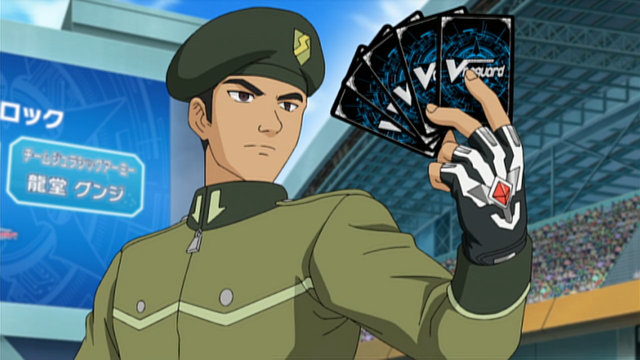 He uses a Tachikaze deck, comprised of units that retire their comrades for power. In his debut Ryuudou finds himself backed into a corner against Aichi, forced to check his sixth damage after making a huge tactical error regarding the Knight of Rose, Morganna's power. Luckily he manages to pull a heal trigger, turning the match around at its eleventh hour; after he and his subordinate bests Q4, they are allowed past the elimination round of nationals, where they are defeated off-screen. At the second national Ryuudou reappears, but is soundly defeated in his rematch with a now Qualia-possessed Aichi. Although Gunji is known to retire his units as necessary for victory, he is appalled by how Sendou treats his own army. While he believes that there is such thing as necessary sacrifice, Ryuudou does not believe that someone like Aichi should be adopting these tactics. Gunji's initial battles leave him with a strong admiration for Sendou and his sound tactics. As their teams part he acknowledges this with a salute, wishing to show who it was who had managed to push him into a corner. Like Suzugamori Ren, Gunji sacrifices his rearguards in order for his strongest soldiers to attack. Unlike Ren however, Ryuudou considers these sad but necessary sacrifices, and treats their loss with respect as he would an army. Furthermore, his Tachikaze deck is strongly characterized by how it returns those destroyed units to his hand for maximized efficiency, much unlike the Shadow Paladins' wholesale slaughter. His overall style is to take the first move using Sonic Noah, moving Dragon Egg to the rearguard to serve as a sacrifice for later units like Cannongear and Deathrex. Egg's counterblast is a provision to let Gunji recycle the unit and later use it as a powerful shield to wall off opponents. For his Deathrex's support Gunji initially uses Savage Destroyer, who gains power when a unit is retired, tying into Deathrex's forced retire. This unit is eventually phased out for Gigarex, whose higher overall power makes the investment more worth using. Gunji fills his field earlier in fights, which generally leaves him with a lower hand than the opponent, opening him to attack. He has an easier time drawing triggers than most fighters shown in the anime due to how he uses Sparksaurus and Blastsaurus to thin the deck, retiring them and superior calling other copies of themselves. 1. "Toshihiro OKUBO." Anime News Network. Anime News Network, n.d. Web. 7 May 2012. <http://www.animenewsnetwork.com/encyclopedia/people.php?id=59634 >.